Excel Spreadsheet for Hyperproductive Scrum Teams - very cool! 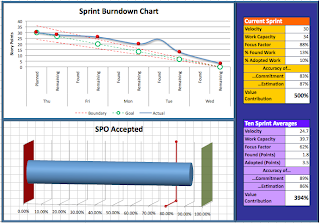 Scrum teams use lightweight metrics like story points, the burndown chart, and team velocity. The inventor of Scrum was a fighter pilot and used the burndown chart to help teams land a sprint properly. Recent work with hyperproductive teams shows they are like modern jet fighters in two ways. They have engines that produce velocity—alignment of the team, and team spirit. And they carefully measures aspects of performance to make slight adjustments in flight. Failing to constantly adjust the flight of the team can result in a hyperproductive crash into waterfall performance. One hour discussion of a comprehensive, yet minimal set of team metrics used in an environment where hyperproductive teams are the norm, along with an Excel spreadsheet that can be used by any Scrum team to improve performance. Velocity, story completion by priority, work in progress, story acceptance rate by product owner, unplanned work, and trending accuracy of estimates all appear to be essential to determine the altitude, velocity, angle of attack, and attitude of a hyperproductive team. Slight adjustment of these parameters on a daily basis keeps the team on target. Half hour questions and discussion on using the Excel spreadsheet to improve team performance. Please give us a few positive comments in a review so Agile 2010 will get this submission on the agenda for the conference. You can download the spreadsheet at the link above. Pete Deemer, our Business Manager at the Scrum Training Institute, has written an excellent article on the role of the manager in Scrum. Like me, you probably get asked the following question quite often: "What's the role of a manager in Scrum? I'm a manager, and since I'm not mentioned in the definition of the Scrum roles, and the team is self-organizing, does that mean I'm supposed to just... disappear?" Agile 2010 Abstract Posted: Hitting the Wall! ll-at-once Scrum implementations require total commitment to change, high level management participation and aggressive removal of impediments. In July of 2009, Pegasystems (NASDAQ:PEGA) deployed 27 Scrum teams in the U.S. and India in less than two months and global continuous integration became a top priority impediment. To avoid “hitting the wall” before the first major Scrum release of their enterprise software applications, a Scrum SWAT team engineered a continuous integration environment for hundreds of software developers on two continents within a few weeks. Create a free account at http://agile2010.agilealliance.org/speaker.html and you can download and review a draft of this paper.